President Jacob Zuma is using all the wiles of a spoilt child trying to get his parents to buy a coveted toy. Except that this particular desired bauble – a new presidential jet with all the bells-and-whistles – will cost around R4 billion. And that’s a price tag to be picked up not by affluent and indulgent parents, but by the long-suffering SA taxpayers already gatvol over the costs of Zuma and his enormous household. The narrative on this issue in the Presidency’s public statements is risibly self-serving. The leitmotif is that Zuma certainly does not WANT a new jet to replace Inkwazi, the Boeing 737 that he currently uses on state visits and to pop over to see the Gupta cronies in Dubai. Oh, no. It’s that he NEEDS a new jet. Because Inkwazi, meaning Fish Eagle, is kaput. It is broken. It keeps leaving Zuma stranded in far-flung, inclement places like Burundi and Qatar. Each time an aircraft has to be rented to fetch the presidential entourage. The Presidency’s sub-text is that Inkwazi is destined for the junk heap. It is not only past sell-by date, it is now positively lethal, putting our beloved leader at imminent risk of life and limb. 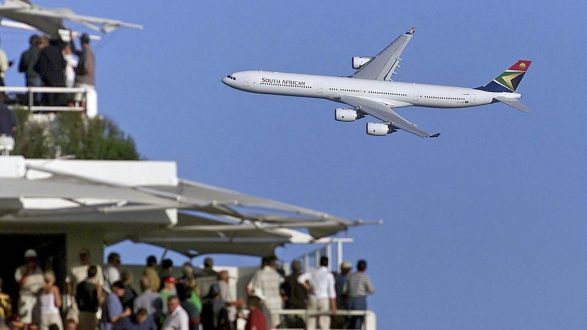 According to a Media24 aviation writer Erika Gibson, Zuma and his security staff last week refused point-blank to fly on a now repaired Inkwazi to Durban because of fears of “sabotage” of the plane. The Presidency denies this. Zuma and his staff were merely demanding a “reliable” plane, says the Presidency. It added that the defence force was looking to find “long term solutions to the plane debacle which affects both the President and the Deputy President”. For “long term” read “shiny, new and expensive”. The truth is almost certainly more prosaic than the sinister theories of sabotage. Inkwazi keeps breaking down for the same reason that heads come off plastic dolls and wheels snap off toy motorcars. Because they are not looked after properly. Jensen flew SAA Boeing 737 aircraft for seven years. The presidential Boeing, he said, is a robust‚ luxury aircraft that should, if maintained and operated correctly, last up to 30 years, even when worked hard 15 hours a day, as opposed to the much lighter use that Inkwazi gets. That’s the authoritative view also of DefenceWeb. It ascribes the problems with Zuma’s plane to a much wider South African Air Force malaise, the exit of skilled technicians, which has “decreased dramatically” the SAAF’s aircraft maintenance capacity. The problem started when the SA National Defence Force closed down space for the advancement through the ranks of white personnel, in the new post-1994 military. There was an enormous exit of skills to the private sector and in emigration, forcing the SAAF to sub-contract maintenance to outside entities. In 2011 the air force maintenance contract was deemed by the auditor general to be irregular. Instead of regularising it with a new tender, the contract was simply terminated by the SAAF, affecting 523 critically skilled civil technicians deployed to air bases countrywide. The VIP aircraft, including Inkwazi, were “almost exclusively” maintained by these civilian personnel. When the trade union Solidarity warned that the cancellation would be “felt heavily” by the president and his cabinet, the SAAF relented and retained 139 technicians to provide “skills transfer” to its own personnel. By the end of April this year, just 50 of those specialists remained. The issue is not one of imputing superiority to white technicians. The issue is getting rid of skills because of race and not doing enough to train replacements. Skills transfer is not a simple process of linking a highly trained technical specialist via an intravenous line to a newly recruited rookie and watching decades of knowledge and experience decant. It is a slow process. The upshot, according to DefenceWeb’s sources, is that across the range of engineering, metallurgy and systems repair, there are just not the people with the critical skills necessary to carry out or oversee the work. The SAAF, however, is sanguine. Brigadier General Marthie Visser says that skills transfer means that the SAAF is no longer dependent on outside organisations and it can now rely on “in-house capabilities for any maintenance and operational requirements”. This, of course, explains the “sabotage” theories. If one believes the hogwash that the SAAF is technically self-sufficient – and politicians propelled by the hot air of their military flunkeys appear to have endless capacities for self-delusion – then sabotage is the only explanation. A source tells me that one of Zuma’s talented wives has already selected a leopard-skin motif for the internal furnishings of the new super-Boeing, Inkwazi Mrk II. And the aircraft will be maintained by a Gupta subsidiary in Dubai. Nah, just kidding. But who knows? This is South Africa. This Jaundiced Eye column appears in Weekend Argus, The Citizen, and Independent on Saturday. WSM is also a book reviewer for the Sunday Times and Business Day. Follow @TheJaundicedEye.